We’ve hand-picked our favorite Amalfi Coast family friendly hotels and holiday rentals, choosing options that are convenient and fun for the whole family. Some of our favorite destinations include Praiano, Minori, and Ischia. In July, the kid-friendly and less touristy town of Minori hosts the Arte al Sole kids arts and cultural day camp program! 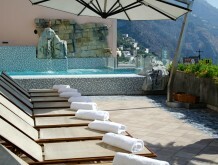 Via Gennaro Capriglione 119 Praiano 150-280 euroThis family-run hotel in the middle of the lovely town of Praiano overlooks the Duomo, with a pool, terrace, and additional dining terrace looking toward Positano and Capri. Much less crowded and with some of the best beaches around, Praiano is a peaceful alternative to bustling Positano in the summer and fall. 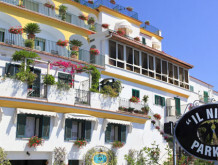 Via Vittorio Veneto 1 Sorrento 80067200-400 euroElegant hotel with captivating views across the Bay of Naples, walking distance to sites in the center, with a charming atmosphere among the gardens, pool, dining, and services. Family room options include triple rooms and family suites, with rollaway beds available. Via Bizantina 3 Ravello 160-250 euroBetween Amalfi and one of our favorite Amalfi Coast towns, Minori, is a pristine strip of coastline known as the Marmorata. 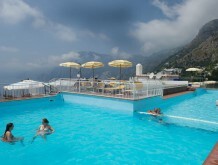 Ravello Hotel Marmorata offers great value to families with a pool and private beach access on a sparkling cove. Via Umberto I Praiano 84010180-290 euroThe family-run three-star Hotel Margherita was parent recommended to Italiakids.com as excellent location for exploring Naples and the Amalfi Coast, good value, and high level of customer service. Their small boat day trip to Capri operated by the hotel is also recommended. Triple and quad family rooms are available. Via Salvatore Quasimodo 30 Amalfi 84011110-220 euroKid friendly budget Amalfi Coast hotel with seaview terraces in every room positioned only 300m from the beach. and a beautiful terrace for breakfast. The hotel offers triple rooms and the option to add an additional rollaway bed for only 20 euro per night. 8 Luigi Serio Vico Esquense 500-700 euroSmall luxury boutique hotel in a private cove near Sorrento with family friendly amenities likes bikes and kayaks. 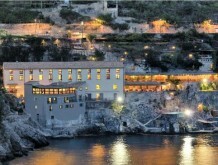 In addition to the pool nestled on the sea, the hotel has a spa, gym, gardens, bar and dining options. Extra beds are available in the room for a fee for children under 12, baby cots for children 3 and under are free.